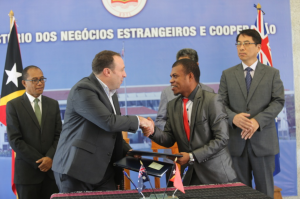 The Secretary of State for Vocational Training and Employment, Julião da Silva, signed a memorandum of understanding with the Australian Ambassador to Timor-Leste, Peter Roberts, representing the Government of Australia, for the Seasonal Work Program. The memorandum was signed on January 17 at the Ministry of Foreign Affairs and Cooperation. The program started in 2011 allows Timorese workers to develop skills and earn income when employed by Australian companies. Applicants will pass a physical fitness test and demonstrate competence in the use of English. Placements will be for periods of up to six months. In his speech, the Secretary of State noted that the signing of this memorandum will allow the continuation of the Program begun in 2011, with the memorandum of understanding signed by the Government of the Democratic Republic of Timor-Leste and the Government of Australia. Julião da Silva also said that the Government of Timor-Leste will soon sign a memorandum of understanding with the Government of Australia for the Pacific Work Program, which will cover low and medium-skilled workers who will work in rural areas of Australia. On behalf of the Eight Constitutional Government, the Secretary of State thanked the Government of Australia for the opportunity to employ Timorese youth in Australia and thereby reduce the unemployment rate in East Timor.